Almirola's victory is a significant one for other reasons as well, of course. 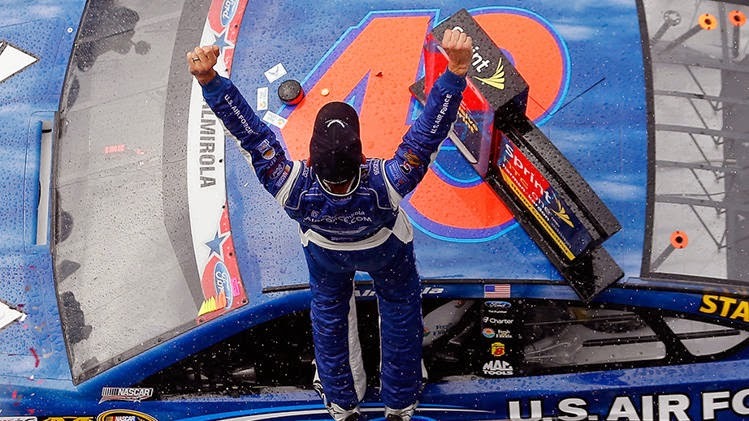 This is Almirola's first ever NASCAR win (although he did technically win the 2007 Busch Series race at Milwaukee despite being relieved by Denny Hamlin thanks to some sponsorship nonsense). A Petty team has not won a race since John Andretti at Martinsville in April 1999 and this past weekend marked the 30th anniverary of Richard Petty's last victory in the 1984 Firecracker 400 at Daytona. And anybody that tries to detract from Almirola's victory because it was a race shortened by rain is a fool. Last time I checked, a win is a win and it is not Almirola's fault that the rain came when it did, nor is it his fault that the field was ravaged by a pair of big wrecks (first involving 16 cars, second involved a whopping 26). Almirola was fortunate to not be involved in either incident (he was leading at the time of the second wreck) and he had a good enough car to get a strong finish. But this is the kind of win that NASCAR wants in this points system, one that can propel a driver like Almirola who probably does not have the elite equipment that can get him in contention to make the Chase in the traditional fashion. This gives drivers that do not drive for the top teams a chance to compete for the championship by rewarding them for winning. Given how tough it is to win in this series, it gives the smaller teams more hope that with striking the iron while it is hot, they have a chance to compete for the sport's biggest prize. And here's the thing that people are failing to realize: Almirola is not even the driver that is lowest in points with a victory. That would be Kurt Busch, who won at Martinsville but is still only 24th in points thanks to having five DNF's in the first 12 races that sank him to 28th after Charlotte. In a way, the Chase has now become like the NCAA Tournament with each race serving as a conference tournament with a win securing a Chase berth, as suggested by Tony DiZinno at Motorsports Talk. A surprise win like Almirola's is almost like a middle of the road program peaking at the right time to win their conference tournament and get a crack at the big show. And for Almirola's Richard Petty Motorsports team, they may not be done with getting drivers into the Chase. There remains one more "wild card" race in the road course at Watkins Glen in a month. RPM's other driver, Marcos Ambrose, happens to be one of the elite road racers on the circuit with two wins at the Glen and only one non-top three finish at that course, which came a year ago when he was wrecked late in the race. He has a great chance, one would think, to seal another Chase berth. That's right, and I was looking at Andretti's Racing Reference page when I made the post. Thanks.